This is a painting of Vancouver on a non-wintry un-gray day. It is a scene one might see while on an early morning run. On every other day when the forecast for Vancouver is 8 degrees and rainy, you expect a predictable monochromatic drone of busy. Today is one of those rare, clear and calm mornings. There may be fistfuls of clouds on the horizon and bridges to cross eventually, but not now. Today will be a good day. The most significant objects in the scene are the bridges. 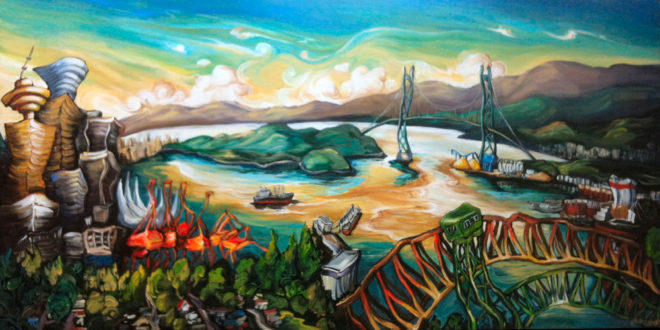 The view moves through the muscular Ironworkers and train bridges to the more lyrical Lion’s Gate span in the distance. Bridges are metaphors for connection and journeys. They are also symbols of patience – “We’ll cross that bridge when we come to it” – and reminders to stay on good terms, as in the old warning, “Don’t burn your bridges behind you.” Bridges mark points of union and transition. Bridges cross chasms and troubled water to allow safe passage from one point to another. This scene is a visual pathway through a busy industry towards a calmer horizon. The essence of this scene is calm anticipation, like the deep breath before climbing a hill or the moment you wake up and realize the kids are still asleep. The aerial point of view shows the curvature of the earth; it’s what you might see if you could fly. Sometimes, on days like this one, you really feel like you can.